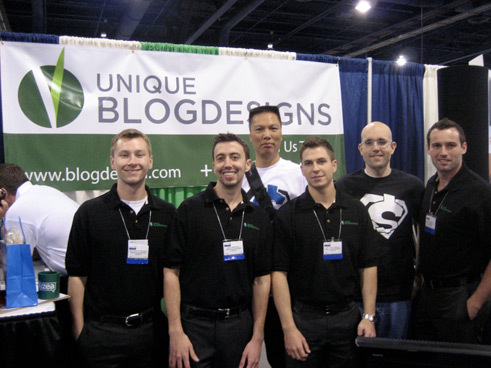 About 3 weeks after first I redesigned John Chow’s blog (mid-September), my business partner, Josh, stumbled upon a tradeshow devoted entirely to bloggers. 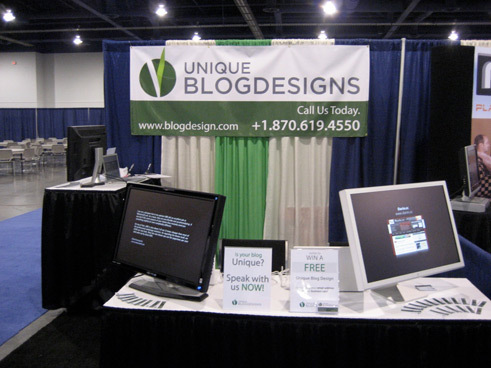 Being that we had just started UBD and we were starting to experience some early success, we decided it would be an incredible branding opportunity to exhibit a booth at Blog World Expo (BWE), which was held November 8-9 in Las Vegas, Nevada. Immediately upon hearing about the event, we called up BWE and spoke to the chief organizer, Rick Calvert. We all know that on the Internet, word travels fast. Since I had redesigned Shoemoney’s blog shortly after John Chow, Rick knew exactly who I and UBD were and he kindly invited us to speak and showcase our company at BWE. I have never been to Las Vegas, despite living only a 4-hour car drive from the city. I also have never been to a trade show, let alone exhibited a company at one. Two months of preparation went into our attendance at BWE. Our drive up to Vegas started Wednesday morning at 2am. It took us about 4.5 hours to get to Las Vegas. The drive from Phoenix to Las Vegas is beautiful. 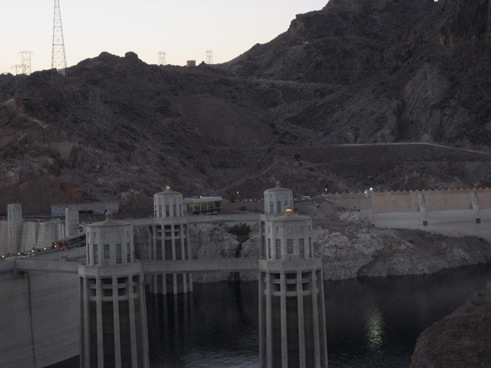 We crossed over the Hoover Dam! It reminded me of that scene in Transformers. 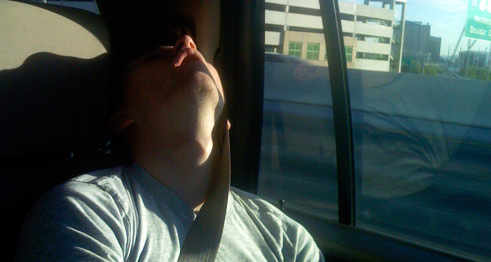 As you can see, Matt slept the whole way up. Blog World Expo was probably the most awesome time I’ve ever had. There are few words to describe the non-stop excitement our team had been feeling over the past week. To put it simply, attending and exhibiting Blog World Expo was one of the coolest things we have ever done. The opportunity to present out company and network with like-minded individuals was unquantifiable. 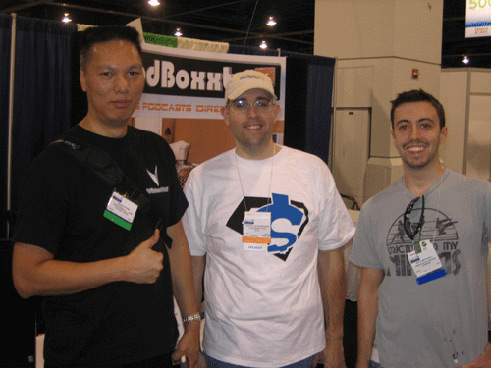 Meeting John Chow and Shoemoney the day before the Expo was awesome! 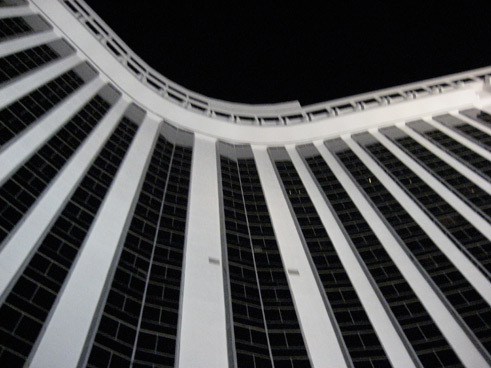 We stayed at the Las Vegas Hilton which is right across from the Las Vegas Convention Hall. It was a perfect spot and several other bloggers were staying there, such as Zac Johnson and John Chow. I strongly encourage anyone who wants to be successful in an industry to start attending tradeshows. The people you meet and the things you learn are well worth the cost of hotel, travel expenses, and conference passes. For geeks like me who spend 12-hours a day, 7 days a week working online, meeting new people in real life is something that doesn’t happen as much as it use to. Funny as it was, BWE was the opportunity to meet a lot of other people just like me. Ms. Danielle was right on when she said “bloggers are a legit group of people.” It was awesome to meet people who I had felt like I had known for a long time. In reality, most of the people I am close to online, I have only known for a few months. 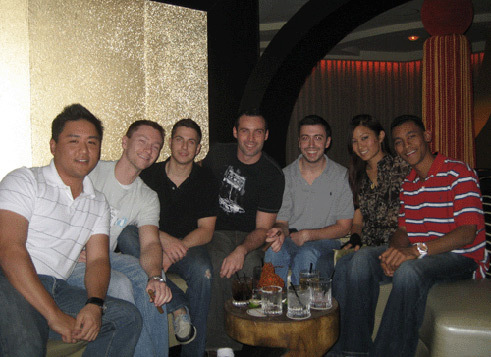 After the expo each night, I was able to hang out with a select group of friends that I have known online for a while now including: Ms. Danielle, Anthony, Gary, Vinay, Chris, Greg, Darin, Prija, and especially Shoemoney, Neil Patel and John Chow. The actual Expo was not only productive, but also surprisingly a ton of fun. Like I mentioned before, we secured a booth for BWE in September, so it was very exciting to present our company face-to-face to so many people. We brought my 30″ Apple Cinema Display and Matt and Josh’s two 28″ displays. We used our screens to showcase some of our recent client work. 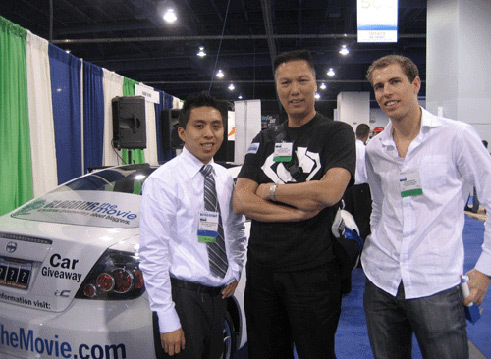 The two people I wanted to meet most at Blog World were obviously John Chow and Shoemoney. 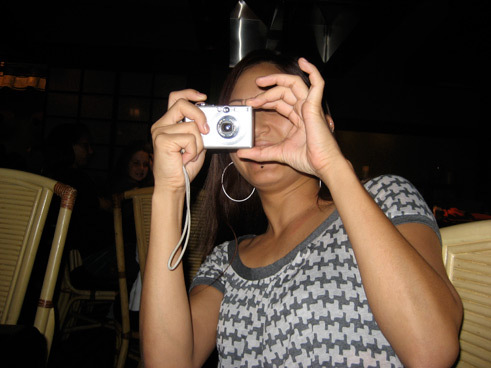 John Chow was the FIRST blog I ever discovered (on Digg in November 2006). Shoemoney’s blog has always been a favorite of mine, as well. In fact, even during my busiest times where I’ve spent zero time on the blogosphere, I have never gone a day without reading either of their blogs. Both Shoe and John are extremely nice and down to earth people. They are just as interesting and entertaining in real life as they are on their blogs, if not more so. I am looking forward to attending more tradeshows where they are present, such as Pubcon and CES. In fact, in only 3 weeks from now, UBD and I will be back in Vegas for Shoemoney’s Roll With The Search Engine Rockstar contest at Pubcon. My buddy, Prija from Blogging The Movie, was also exhibiting at BWE. I first met Prija a few months ago when he and his PR rep, Huy, drove out to Arizona (from SoCal) so we could design his blog in a day. Within 10 minutes of meeting Prija, I could instantly tell he was going to be successful because of his incredible and energy and passion for his business venture. It is great to meet other young entrepreneurs with big plans and the guts to see them through. Anthony Carbone and Vinay Menon were two of the first people to start reading my blog back in January of this year. Like me, they are both serious exotic car fans, and they run a popular exotic car photo sharing site called MadWhips.com. In March of this year, we created an automotive blog together called Carzi. Needless to say, I have been good friends with both of these guys since January and that is years in Internet-time. It was awesome to finally meet these two dedicated and motivating individuals. It was like I have known them for several years the first time we met up and got to chatting. Look out for big things from these two! Overall, BWE went WAY better than expected and we had very high expectations. It was an incredibly positive experience. Thanks to everyone who added to its awesomeness. I met a ton of cool people who I have known online for quite a while now, so it was like meeting old friends for the first time. It is crazy that the Internet can bring people together before they ever meet. Once you know someone online, meeting them in real life is more natural AND exciting! 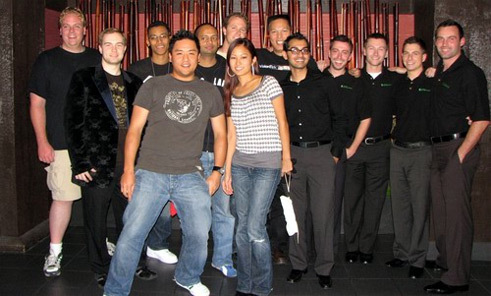 The John Chow Blogger Dinner – THANK YOU, John! Myself and Wendy Piersall (eMom) at Blog World! As I mentioned before, I strongly recommend that anyone who wants to be successful within any industry attend as many tradeshows as possible. This is true for many professions especially tech and Internet-related ones. Other tradeshows which come recommended are Pubcon, CES, Affiliate Summit West and SES. Tradeshows such as Blog World Expo are awesome learning and networking opportunities that no one should miss. I am a trade show addict now. See you at Pubcon. About a week ago, right after the launch of UBD and the redesigned John Chow theme, I received an email from Shoemoney who was interested in updating the look of his blog. Shoemoney wanted to retain his basic layout, but polish it up with some web 2.0 goodness and add a few new features. Shoemoney is somewhat of a PHP guru so we were able to get his theme coded, tested, and configured real quickly. What you see above is the finished product. You can read more about the design here. Special thanks to Shoemoney for the design opportunity and also thanks to my super-awesome WP coder, Chris at PSDChopstick.com. As many of you know, last week, I launched a new online business. Developing this business has allowed me to experiment with some new direct marketing techniques which I have only recently learned about. One specific example is releasing a free ebook in order to promote your blog or business. John Chow, Jane May, and Mitch Harper all do this. All are also successful bloggers and entrepreneurs. Obviously, there has to be serious benefits to using a free ebook to promote your blog and business. Recently, my business, Unique Blog Designs, distributed a free ebook. Why did UBD give away a free ebook? An ebook is a unique way to distribute information. Unlike a blog entry, which is available to everyone, an ebook is essentially exclusive information depending on the terms of its distribution. In our case, the ebook is only available to those who sign up for our email list. The ebook that UBD launched was titled, “5 Simple Tips To Improve Your Blog.” Like I said, we released the ebook to encourage people to sign up for our email list. I will talk about the advantages of an email list another time, but the point is that the free ebook is a means to an end and an opportunity to show your customers that you offer valuable information. Of course, it’s best if the ebook you are releasing contains highly useful and applicable information. If that is true, then you are showing potential customers that they can associate “quality” and “usefulness” with your brand. Many people think that writing an ebook is a time consuming process. That doesn’t have to be true. The free ebook UBD released is only 8 pages, but contains highly applicable information that new bloggers can use to improve their blogs. That ebook only took around 2 hours to write. It is well worth the investment in time considering it will certainly increase our opt-in rate. Not only that, but giving away something for free has a lot of power. It shows your potential clients that you are willing to go above and beyond the normal expectations of doing business. This in of itself makes releasing the free ebook a worthwhile investment. The fact is that by giving something away for free, you are increasing the conversion rate (number of opt-ins) for an email list. Mitch Harper of Interspire even says “every blog should have an accompanying ebook.” If Mitch says that, it’s good enough for me. 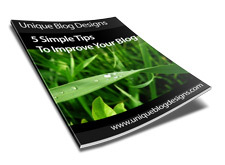 If you are interested in receiving the free ebook, “5 Simple Tips To Improve Your Blog,” then visit Unique Blog Designs and sign up for the newsletter. Every so often, we meet a person or group of people who makes an extraordinarily positive impact on our lives. For example, isn’t it awesome when you are trying to solve a problem, and you coincidentally meet the person who can help you solve it? Isn’t it just as cool when you are stumped by a situation, and you gain a fresh perspective from another person? Networking is something everyone does, whether they realize it or not. We are always constantly meeting new people in an effort to better ourselves and to solve the problems we encounter, whether they be personal or professional. As I said recently in this space, I have found that it is much more efficient to network with people online than it is in real life. People online seems to be more friendly and willing to share their experience and knowledge. Through my blog and other efforts to network online, I have met a lot of great people over the past few months. I have compiled my top five reasons for networking online. No one knows everything. The fact is that most people have one main area of expertise and are less skilled in other areas. The owner of an e-business has to take on many different jobs and tasks. Though I have learned many skills in the past few months related to running a business, in truth I am a business novice; there are many situations that I don’t know how to handle. Thanks to my network of friends and supporters, I am almost always able to find the right advice from someone who has experience in a specific area. New opportunities for business ventures. Just because you live in Hong Kong and I live in Arizona doesn’t mean we can’t work together! Networking business people and entrepreneurs is something the Internet does very well now through social networks such as LinkedIn and PartnerUp. These networks are the stomping grounds of successful people and those who are looking to become successful. Market yourself before you ever meet. One of the best things about blogging is that you are able to market yourself and your abilities prior to interacting with others. If you convey a professional, dedicated, and serious online persona, people will seek you out for knowledge, business opportunities, and work! A global perspective. Let’s face it. Despite how much we think we know, we know precious little in the global scheme of things. We are fortunate that the Internet brings together diverse people and cultures. Who do you think knows more about marketing in China – I or someone from China? That being said, there are fundamental similarities we all share, and a love of the Internet and business is something I have used as starting point to find common ground with people all over the world! The perfect candidate is out there. All of us who have started or run our own business know the difficulty of finding the right person for the job. We all have an idea of who the “right candidate” is, but in the traditional hiring process, we hire only those who are local to us. The Internet has changed all that; businesses are now being started and becoming successful without its employees ever meeting each other! If you have not started chatting with people in your community or network, I highly recommend that you begin doing so. And by chatting, I mean using an IM client, such as Skype, Gtalk, MSN, or AIM. I use all four of those to keep in contact with between 30-50 people, all of whom I have “met” in the past 4 months. Some of the best business advice, tips, and strategies I have received have occurred in instant-message conversations. I strongly believe “What goes around, comes around,” otherwise known as Karma. By sharing your knowledge and advice with others, you generate good will that comes back around to you. The potential for generating goodwill is virtually unlimited through online networking. New eggs are hatched constantly that may determine your path and success in life.